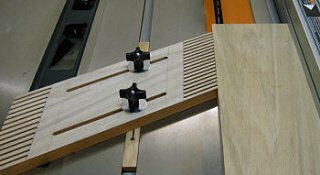 The featherboard is a clever, yet quite simple woodworking jig that keeps your stock held firmly against the rip fence and your fingers out of harm's way. It is particularly useful when ripping narrow or short stock. Featherboards can also be used to keep your stock planted to the table surface by attaching one to the rip fence. This helps reduce the chance of kickback significantly. While you can buy plastic or hardwood featherboards at most places that sell woodworking supplies, I like to make my own and keep several on hand for different applications. Making my own allows me to design different styles to fit my needs. I make mine out of oak, but almost any hardwood will do. This board has fingers on both ends. It also has two attachment points to keep it in place. Make sure it doesn't have any surface checks, end splits, knots or other imperfections that could affect the performance of the finished board. It should be nice and flat, with no cup or twist. In other words, if you want a nice feather board, choose nice wood. Most featherboards I see utilize only one end of the board and leave the other end square. To me, this seems like a waste. I like to put fingers on both ends of the board to get double duty out of my expensive hardwood. I can also make the fingers on one end thinner or thicker than the other to make it more useful for different operations. Below, I'll illustrate how I make this featherboard for my table saw, but you can easily modify the design to fit your table saw or router application. I start with a piece of red oak 3/4" x 5 1/2" x 18" and miter one end at 30 degrees and then spin the board around and miter the other end the same. This can be done on a miter saw or the table saw. I want the fingers (feathers) on one end of this board to be 1/4" wide, so to start I set the fence at 1/4" and make the first cut to the line drawn earlier. It's best to start on the short side of the board so that any undercut will be on the bottom of the finished featherboard. Note: To minimize the undercut on the bottom side of the workpiece, make sure your saw blade is as high as it will go. After I reach the line, while still holding onto the stock, I shut off the saw. After each cut, let the saw blade come to a complete stop before making adjustments for the next cut  this is for obvious safety reasons. Because I want the fingers to be the same width, I have to add the width of the kerf (the width of the cut left by the blade) to the first finger's width of 1/4" to make the second cut. When I measure the kerf with my trusty digital calipers, it turns out to be 1/8". If I add this to the 1/4" width of the first finger I cut, it gives me 3/8". This is the amount that I must move the fence before I can take the second cut. In fact, every cut after the first cut will require the fence to be moved 3/8" to compensate for the 1/8" kerf left by the saw blade. I continue cutting the fingers like this until I reach the end of the board. 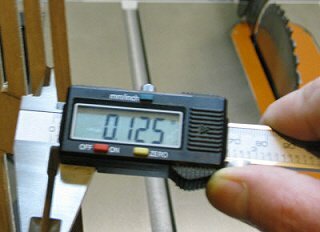 Why measure the kerf instead of the blade? Because the teeth are angled (set) outward from the blade, they leave a cut wider than the thickness of the blade. The blade on my saw is 0.082 thick, yet leaves a 0.125" wide cut. This keeps the blade from binding against the wood and creating friction that could cause all sorts of problems. Another way to get the correct spacing is to rip a gauge stick to the required width, in this case 3/8". After you make the first cut, with the saw shut off and the board still in place, move the fence out of the way and set the gauge stick against the board, then slide the fence up against the gauge stick and lock into position. Now remove both the board and stick, set the board against the fence and cut the next finger. Repeat till all the fingers are cut. When I get to the last cut, and there's not quite enough material left to make the last two fingers the right width, I'll usually split the difference by eyeballing the middle and make the cut. Of course, if it looks like there will only be a sliver of material left after the last cut, I will rip it the entire length of the board. I make the other end exactly the same, except this time I want the fingers to be 3/16" wide instead of 1/4", so instead of moving the fence 3/8" after each cut, I move it 5/16"  3/16" plus the 1/8" for the saw blade kerf. 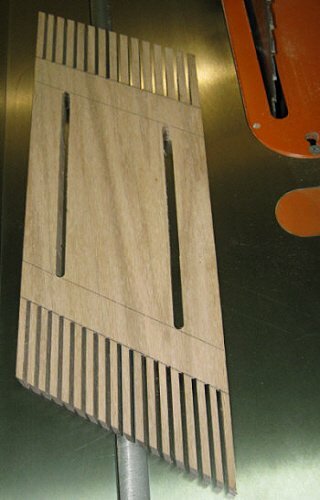 Below is the finished body of the featherboard with the 1/4" fingers at the top and the 3/16" fingers at the bottom. To make the mounting slots I drew a line one inch from each stop line and also one inch in from each side of the board. Using a router with a 1/4" straight cut bit, I cut two slots lengthways on the inside of the lines as shown in the picture on the right. 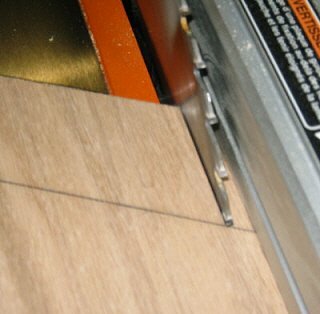 If you don't have access to a router, you can drill a 1/4" hole in each inside corner of your lines and then use a jigsaw or keyhole saw to cut out the slots. That's about it for the main body. You might want to lightly sand the edges smooth and clean up around the slots if you had to cut them with a jigsaw. Now we need some way to attach the featherboard to the table saw. We'll do this by making a hardwood runner that will slide in the miter slot of your saw and allow the featherboard to be positioned where it is most useful. The miter slot on my table saw is 3/4" wide by just over 3/8" deep. I ripped a piece of oak from a scrap board that I had salvaged off some old furniture to a size that would fit snuggly in the slot while still being able to slide fairly easily. The overall length was 18", but it will be trimmed to approximately 12" after the holes are drilled and the slot is cut. Leaving it longer for now just makes it easier to handle, especially when cutting the slot down the middle. Set the featherboard with the fingers flat up against the saw blade and center the runner. Then mark the center of each slot by drawing a line on the runner with a pencil, as in the picture on the left. Using a square, draw a line through the center of the two lines drawn earlier. Now measure over 2" toward the end of the runner from either line and draw another line. Then measure 2" from that line and draw another. Do the same for the other side. It should look the same as the picture at the top on the left. Drill a 1/4" hole in the center of each of the four inside lines, and then countersink the two center ones. The countersink should be just deep enough for the head of the machine screw's tapered head to sit flush with the bottom of the runner. Using a jig saw with a narrow blade, cut a slot from the hole on one end, down the middle of the runner, to the hole on the other end. Then cut off the excess material at the two outer lines to finish the runner. To begin assembly, insert the taper head machine screws through the countersunk holes in the runner and slip it into the miter slot. The completed featherboard and it's parts. The hardware consists of two 1/4" x 20 x 2" tapered head machine screws (stovebolts), two 1/4" fender washers, and two 1/4" x 20 hold down knobs with metal inserts. Place the featherboard over the runner with the screws through the slots in the board. Slip the washers over screws and spin the knobs on. When the knobs are tightened, they pull the tapered heads of the machine screws into the countersunk holes and spread the runner apart, applying pressure against the sides of the miter slot. Once properly tightened, it won't move. To use, simply place the fingers flat against your stock about an inch before the blade. Never use it at or behind the blade. Put just enough pressure against the workpiece so that the stock moves forward easily, but resists when pulled back toward the operator. This design has worked very well for me over the years. It should be noted that I don't like a lot of flex in the fingers of my boards, which is why I make them out of oak, and why my fingers are fairly wide. If you like your fingers to flex more, simply cut them thinner, or make them a little longer.